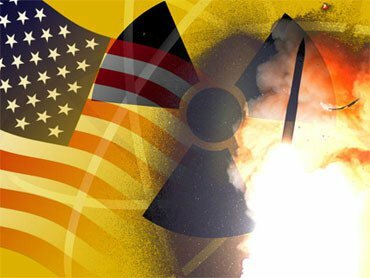 Dr. Paul Craig Roberts, who served as an Assistant Secretary of the Treasury for Economic Policy in the Reagan administration, shares his view that there is a real likelihood of a nuclear war breaking out. Below are the main points covered in this radio programme. Firstly there is the Wolfowitz doctrine, which basically makes it clear that the United States should prevent the rise of any state that could present sufficient power to threaten American unilateral action. Russia has risen and has displayed such power. This is the reason for the constant demonisation of Russia’s leader. We have the number one candidate for the democratic nomination, Hillary Clinton, who now compares the President of Russia with Hitler. So what has happened is that every American president during my lifetime, especially Nixon and Reagan, worked to create trust between the two major nuclear powers. But beginning with the Clinton regime, the trust that had been achieved was progressively destroyed. When you destroy trust between nuclear powers you recreate the possibility of nuclear war, either by intent, or miscalculation. So this is a reckless and irresponsible act on the part of Washington. The information war that is going on now is to prepare the American population and NATO allies for military conflict with Russia. We now have high level people in the US government and military who go to Congress and say that Russia is an existential threat. This is rubbish! You have to remember that before the wars started in Afghanistan, Iraq, Libya, and Syria, it was the constant demonisation of the leaders of the governments, against the Tailban, Saddam Hussein, Gaddafi and Assad. When you see these kinds of demonisation it fits a pattern. A hot war can come from a new cold war. Another factor is the American military industrial complex, with a turnover of a trillion dollars annually. Their entire revenues come from serving the war capability of the US government. They have a huge interest in having a major enemy. They tried to make terrorists that enemy, but that is not serious enough, so this complex has great interest in recreating the Russian threat. From the neo- conservative standpoint, they actually regard any country with an independent foreign policy to be a threat to the United States. So that part of the equation means that they can move the cold war into a hot war, it only takes a small amount of miscalculation. I don’t see how the Russian government can believe one word coming out of Washington. Some neocons say: what’s the good of nuclear weapons if you can’t use them? They have a theory that the US has sufficient superiority to win a strike against Russia. If the US cannot win against a few thousand Taliban, it will not be able to win a possible conventional war against the Russian Army, Washington will go nuclear rather than lose a conflict with Russia (or China). A nuclear war cannot be won. The neoconservatives now have no competition. There is nobody out there apart from Washington wishing to take over the world. As long as the American vassal states that comprise NATO accept American hegemony, they magnify the chance of a new massive war. Republican candidates are competing with each other to see who can treat Russia the most aggressively.